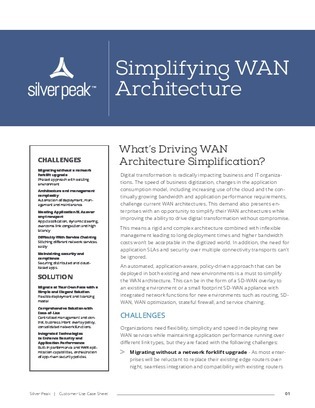 What's Driving WAN Architecture Simplification? The speed of business digitization, increasing use of the cloud, and the continually growing bandwidth and application performance requirements, challenge current WAN architectures. But this demand also presents enterprises with an opportunity to simplify their WAN architectures while improving the ability to drive digital transformation.